So, last weekend I went out of town, then came back and immediately picked up a case of LINGERING ICK. Which is to say, some sort of freaky flu thing that’s had me down for nearly a week, and good lord I did not realize that much ick could fit in a person’s respiratory system. ANYWAY, thank you for your patience as I horked up my lungs. Back to cosmetics! I’ve finally fallen for a piece of Rohan armour: the crafted Eastemnet War Armour. Unfortunately, a lot of the armour released so far with the expansion looks just a little odd on female toons (methinks). Top-heavy, bulky. But the War Armour has a grace to it, and an elegance that suits my female warriors well. 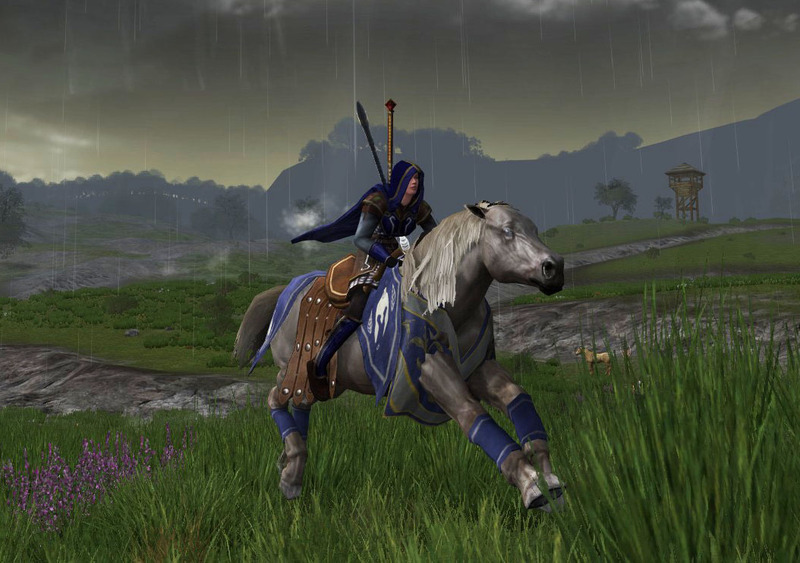 I grabbed the restrained Rohan quest reward Cillan’s Thanks as shoulders, as well as typical Rohirrim quest rewards Wardglofas as gauntlets and the Muddy Rohirric Boots. The weather in-game this morning matches what’s outside my window: thin sunlight, drizzly rain. I love fall days like this. Enjoy! If you let Ered Luin’s spider-filled hinterlands fill in for the Brown Lands, and a level 15 substitute for a Blue Caste level 75 NPC, we’re golden! That said, I’ve been fascinated by the Blue Caste Sorcerers since I first ran across them in the Brown Lands — powerful warriors with arcane might. I decided to make an outfit in homage to these creepy, cranky NPCs. 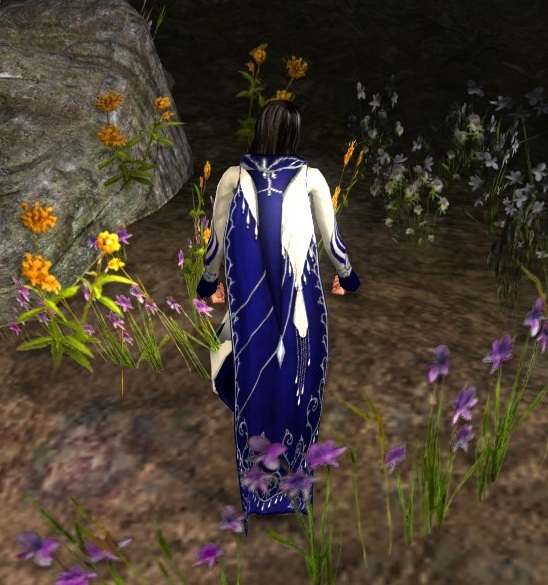 My character’s outfit centers around the (Ceremonial) Robe of the Stone-Student, which is one of the many Moria pieces you can currently pick up in the LOTRO store. 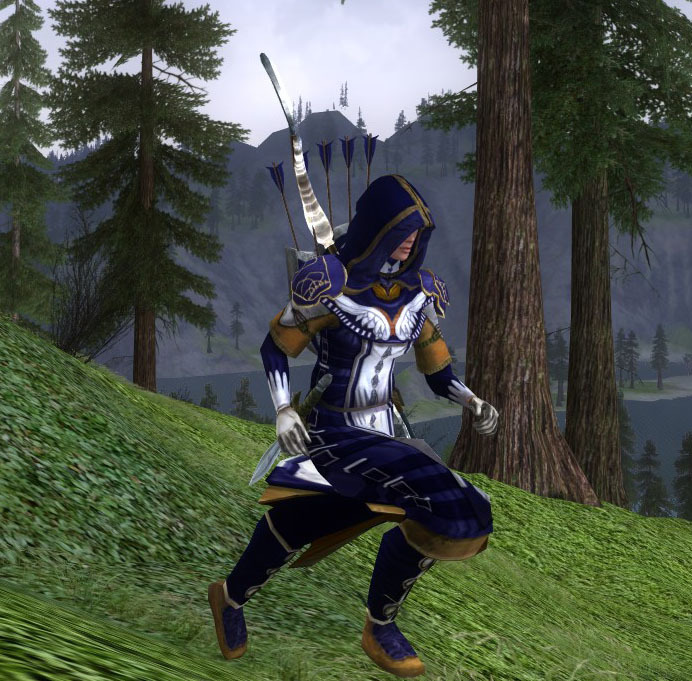 I dyed it navy to approximate the Blue Caste’s robe colors. 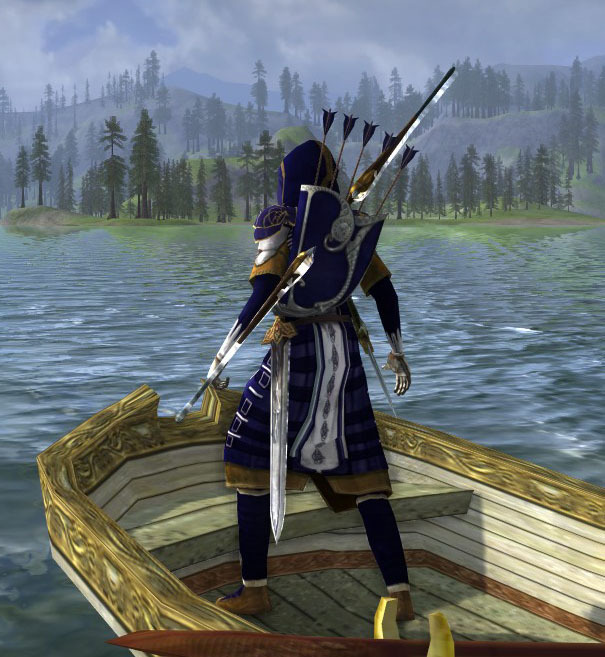 Important supporting pieces include the Padded Mantle of the Dunland Soothsayer (umber), the Plain Cloak (Ered Luin blue), and the navy-dyed Battle-mask of Rhun. Oh, how I love thee, Mariner’s Hauberk. And it’s day four of Hauberk Week — check out what the Ivy‘s doing with the same item! Again, I love this hauberk. I love the vaguely Elven feel to it (note to self: level an Elf past 24, you Man-centric creature), and I love how it’s not so much a sailor’s outfit as a tribute to the sea and birds. That led me immediately back to yesterday’s Gondorian sellsword, and so today, we have a huntress of Dol Amroth. If you wanted to take the Dol Amroth swan idea further than I did, a white-dyed Cloak of the Dove or a lovely blue-dyed Swan-cloak would fit the bill admirably. Expect to see more Dol Amroth here in the future – I know a couple of characters on Landroval who have gone all out in interpreting this gorgeous, ancient city. 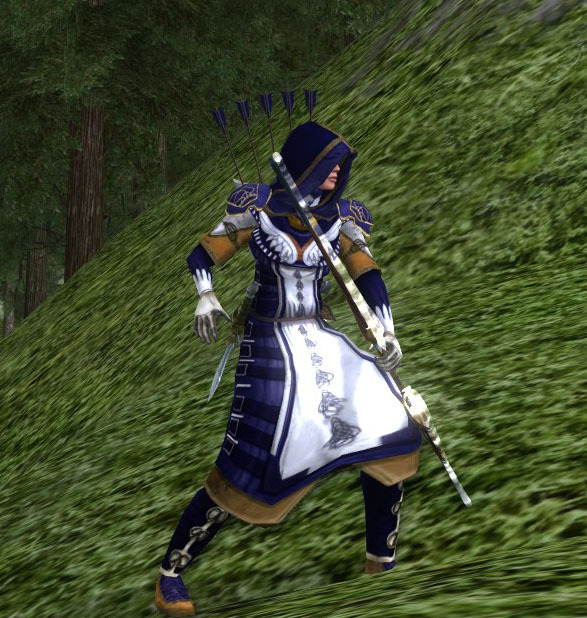 But I used a hunter as a model, and think quivers are underrepresented in outfits, so! 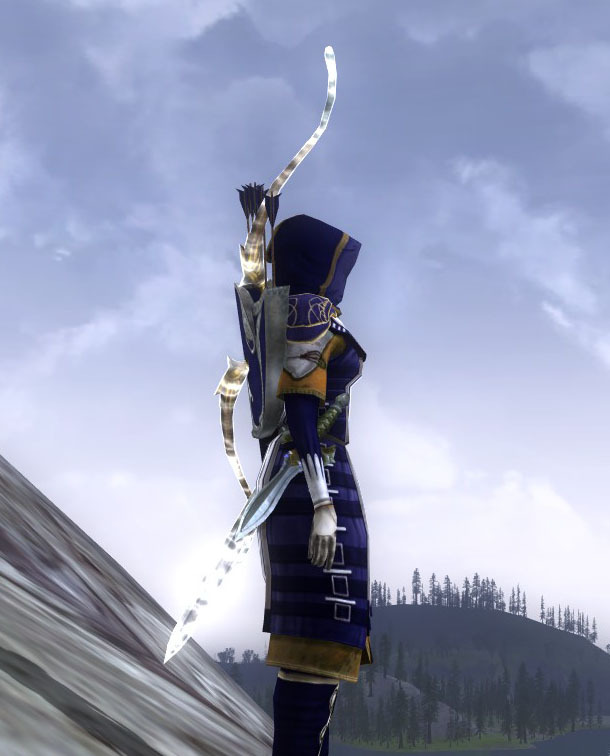 The Fine Elven Quiver suited Silevren’s outfit well. Tomorrow is the last day of Hauberk Week (*tear*), and to finish it all off, Ivy and I are both tackling the Patched Hauberk. Play along in comments or on your own sites if you like! Thanks! We are almost done with Cloak Week (Period of Time)! We have one more Seen on the Streets, and then we’re off to frontal shots and actual outfits again. Thanks for your comments and tweets and interest; cloaks and backpacks add so much to an outfit! 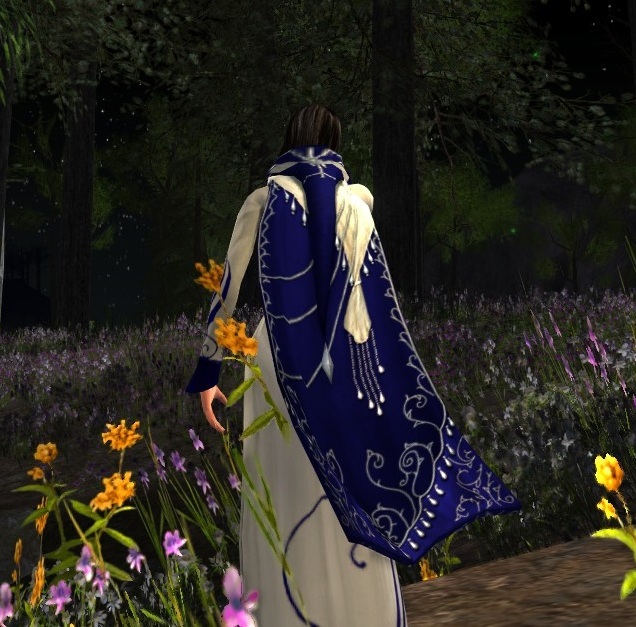 The last of my Most Favored Cloaks is the lovely Elf-lord’s Cloak, which you can acquire in the LOTRO Store. 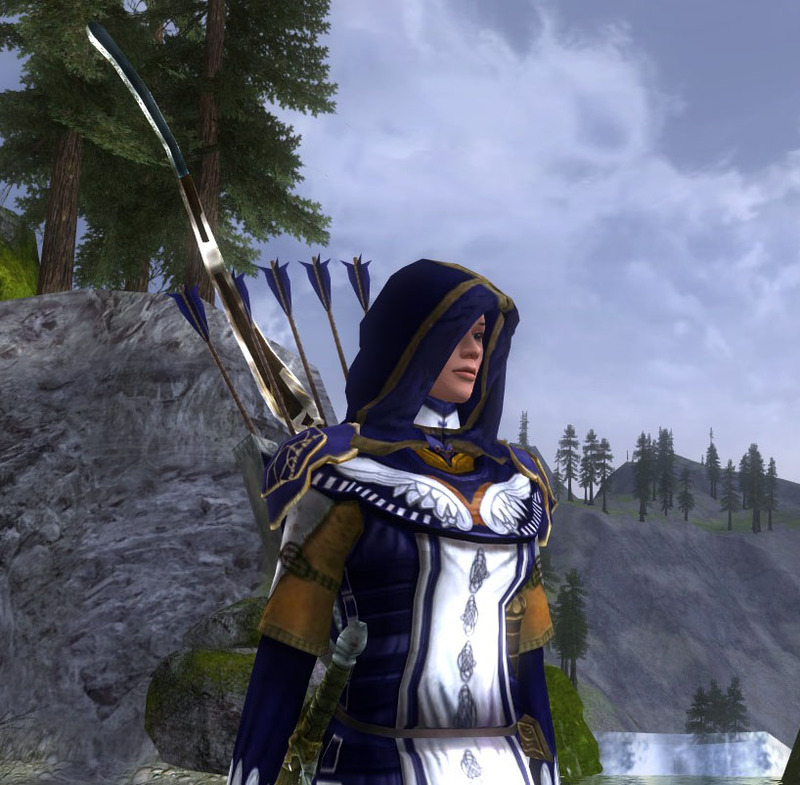 Here’s a hooded version as featured by Cosmetic Lotro (and look, we both wore the same dress to the prom! Embarrassing! 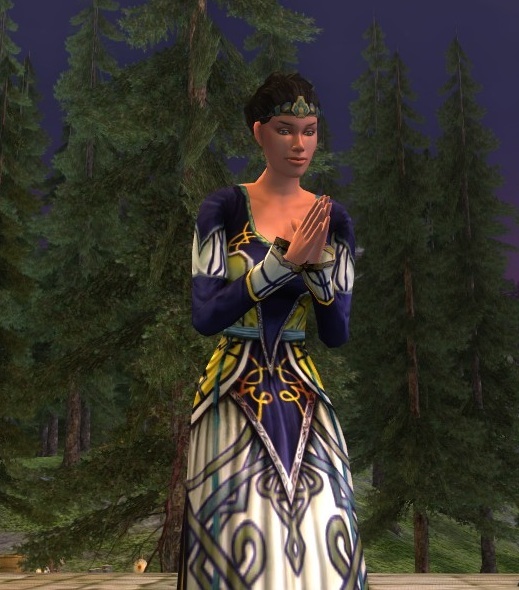 But it shows just how beautifully this dress favors this cloak). Deep, saturated dyes suit this cloak so well, revealing not just stark white embroidery and dropped crystals, but also a slightly lighter band of color at the hem. Really, this one’s just a stunner. I can’t even make up a funny/pithy caption here. 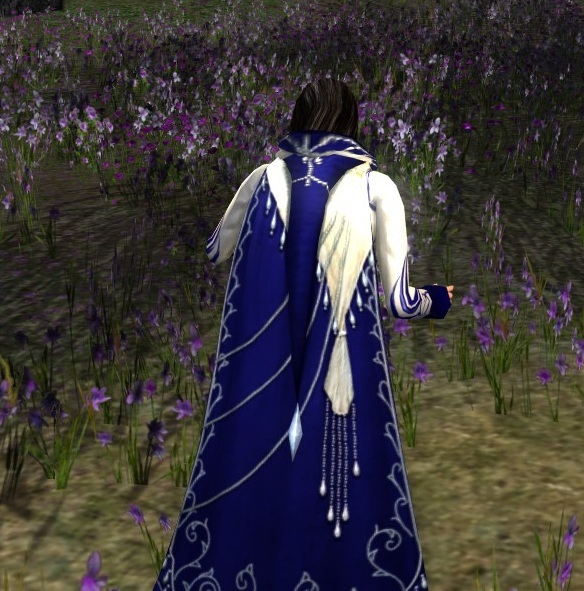 I just love this cloak, and find the combination of white and Ered Luin blue elegant and striking. I want one. Some flowers are best picked under moonlight (or Alt + f10). Nidhil is snickering at just how pretty she is. Sometimes, I like the simple things. Simple outfits, lots of color. I struggled a bit with the Exquisite Long-Sleeved Dress (one of my favorite in-game gowns) because I didn’t want to cover it with cloaks and shoulders and all the rest. It’s a beautiful pattern with great color play. I wanted it to stand on its own. 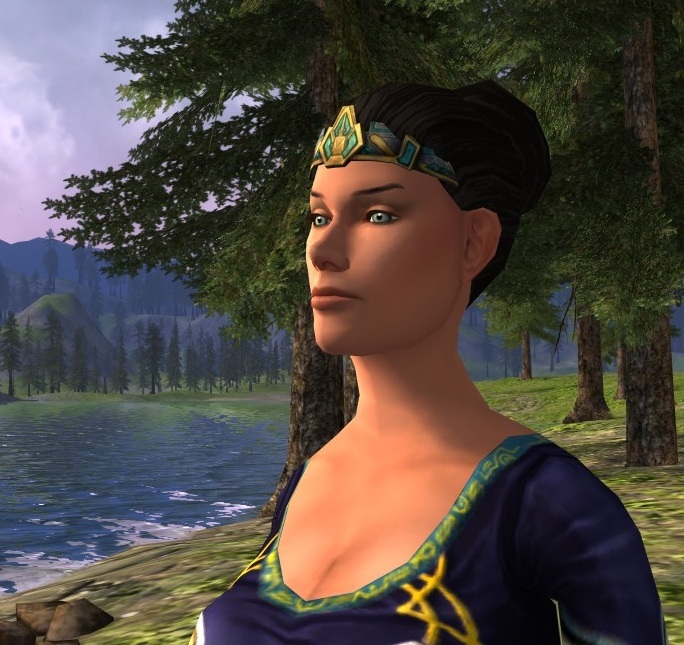 In the end, that’s what I did, with the addition of the Ceremonial Circlet of the Seven Stars (Annúminas cosmetic armour available from skirmish vendors) head-piece that plays up some of the dress’s great detail. Seriously! Check this thing out! Sea-blue detail at the neckline and waistband and some of the knotwork detail on the front of the dress. Gold and yellow. 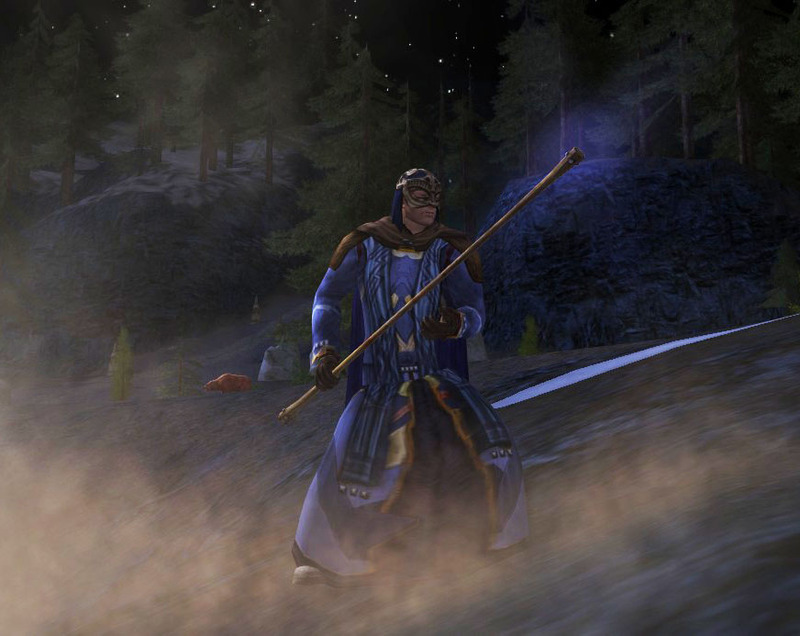 And Ered Luin blue, but that’s because the model character wears nothing but. Short-sleeve and sleeveless versions are available, though I’m of the opinion that the sleeveless version looks too Exquisite Prom Dress for my tastes. Please give me more dresses. And shoulders. Holy cow more shoulders except those wrappy things. And more circlets, but not ones that make me look like 1980s workout videos. Pleaaase. What I really love about this very simple outfit is how the circlet echoes the detail work in the gown, especially in the neckline and around the waist. Some days are gone, to never return.